Jon Bon Jovi might want to rethink his alleged interest in bringing an NFL team to Toronto if a new poll is to be believed. 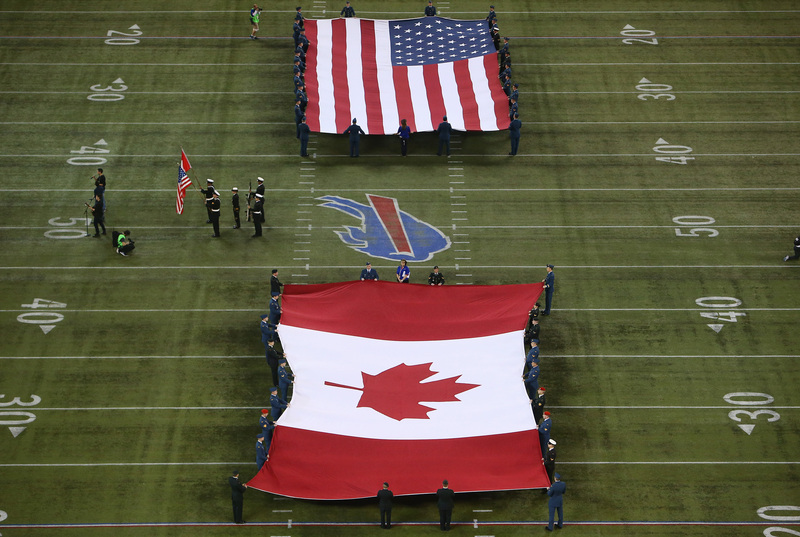 The poll, conducted by University of Lethbridge sociologist Reginald Bibby through Angus Reid Global, shows that Canadians across the country are blasé about the prospect of the NFL coming to Canada and adamantly opposed if it would harm the Canadian Football League. Mess with our league and you won't be welcome is the message. While many polls should be taken with the same skepticism that might greet a Rob Ford press conference, there are good reasons to believe the essence of this one. Television ratings show that the CFL outdraws the NFL with regularity. Add in a sense of national pride that has been growing for the past decade and it's not hard to imagine that Canadians want to protect their own league. The online survey of 1,007 Canadians carried out in mid-November shows that 81 per cent of the respondents who care about the issue either don't want the NFL to establish itself in Canada (40 per cent) or would welcome it only if they were assured that the CFL continued to operate (41 per cent). Only 19 per cent said they would welcome the NFL even if it ultimately killed the CFL. "Simply put, most football fans and many non-fans like things the way they are," Bibby concluded. "To enjoy things American is not to say goodbye to things Canadian. We can like the NFL. But the CFL, despite its ups and downs, has been a long-standing and valued Canadian institution. Its slogan, This Is Our League, seemingly resonates with many. We are not big on sacrifices." That was the predominant opinion of respondents, including those in Toronto where the NFL would surely land if it ever ventures across the border. In Toronto, only 15 per cent said they wanted the NFL regardless of its effect on the CFL. That's an amazingly low number considering that Toronto is considered the area of the country with the least allegiance to the CFL and greatest desire for an American invasion. One-quarter of Torontonians said they don't want the NFL at all or would accept it only if the CFL's future were secured. Support for an NFL team regardless of the consequences was highest in Toronto and lowest on the Prairies. It was also highest (15 per cent) among those aged 18 to 35. However, that same age group was also the most adamant (25 per cent) that they would welcome the NFL only if the CFL continued to exist. An affinity to the CFL follows suit with an early survey by Bibby that showed the CFL had the support of 26 per cent of Canadians while the NFL drew interest from 21 per cent. Thirty per cent of Toronto respondents preferred the NFL, while 22 per cent favoured the CFL. The report cautions anyone seeking to establish an NFL foothold here that underestimating Canada's love of the CFL could have dire consequences. "Any attempt to drop an NFL team in Toronto and proceed to triumphantly market it as 'Canada’s team' – with little consciousness of cultural nerve-endings – may be met with surprising antagonism and indifference by much of the country," Bibby concluded. It noted that anyone considering bringing an NFL team to Toronto -- say Bon Jovi and Maple Leaf Sports and Entertainment, as reported last week -- might want to ensure that the Toronto Argonauts thrive. Interestingly, there are rumblings that MLSE is considering buy the Argos -- and possibly for that very reason. "Rather than needing to be slain as a rival by an incoming NFL team, a healthy CFL might actually be the key to the long-term success of such an NFL initiative," it said. "If appropriate cultural sensitivity and respect is shown towards `our league', NFL backers may find that their franchise has an opportunity to co-exist reasonably harmoniously with the CFL in Canada. "Otherwise, the seemingly invincible NFL just might be thrown for a surprising loss 'up north'." The survey, of course, comes at a time when rumblings about the NFL's interest in Toronto that registered on the Richter scale with the Bon Jovi story. Those rumblings started in the early 1970s.